What are FTP, SSL, CGI, and all those different acronyms? What are storage and bandwidth? Why is a 99.9% uptime guarantee so much better than a 99% uptime guarantee? The amount of space you are given to store your files. 1025 kilobytes (KB) equals 1 megabyte (MB), while 1024MB equals 1 gigabyte (GB). How many files you can store in this space depends on the size of the files, which is normally expressed in KB for text-based and image files, or MB for audio and video files. It varies, but a song file in the mp3 format is typically a little under 1MB for each minute, while you could fit 137,634 different copies of this website's logo into 1000MB of storage. Every time a file is accessed from your website for viewing (or listening, in the case of audio files), this uses bandwidth. If a 10KB file is accessed for viewing, it uses 10KB of bandwidth to download it. If the same 10KB file is accessed from your website 20 times, this will use up 200KB (10KB×20) of your alloted bandwidth. With a hosting account through Lesigns, this allotment is replenished monthly. Think of your hosting service as a telephone, and the domain registrar as the phone company. In order for people to reach your phone, the call must first be forwarded to it by the phone company. Just as the phone company doesn't own your phone, and your phone's manufacturer doesn't own the phone company, hosting and domain registration are two different services. However, unlike phones and phone companies, you may purchase both your hosting and your domain registration through Lesigns for your convenience, or you may choose to buy only hosting through Lesigns, and register your domain elsewhere. When you see http://something.sample.com, "something" is the subdomain. www is actually a subdomain, as in http://www.sample.com, although http://www.sample.com and http://sample.com will usually take you to the same page of the same website, while http://something.sample.com will not. Whether you want to set up a blog, shopping cart or message board, or simply want to maintain a mailing list, you will need databases to store this data. With Lesigns, you have a choice between accessing your mail through an online interface, or through an email program, and can use these interchangeably. Your first line of attack are our mail filters, which selectively bounce messages, based on the content of an e-mail's headers. For more power, use SpamAssassin to scan your incoming mail and determine the probability of a mail message being spam. Enabling SpamAssassin globally makes it process any message sent to your domain, while enabling it per-user will make it scan only the messages destined for a particular mailbox. When enabled, the anti-virus software will scan all incoming messages. In case viruses are found, the server will not deliver the infected messages to the user's mailbox. The anti-virus software is disabled by default, and can be enabled from the Mail Manager in the online Control Panel. File Transfer Protocol. One method you can use to copy files from your computer at home, and upload those copies to your website. If you prefer, you may use the file uploader in your hosting account's control panel instead of FTP, to upload, edit, and delete files from your website. When someone tries to access a page on your website that doesn't exist, they will be automatically taken to a 404 "File not found" page. Many people will leave a website when they run into one of these, but a customized 404 page can help keep visitors there. With Lesigns, editing this page is easy by accessing it through your control panel or FTP. These are all various server-side programming languages, and you will need at least one of these if you want any kind of content management system on your site. Even for something as simple as server-side includes, you will need a server-side programming language. 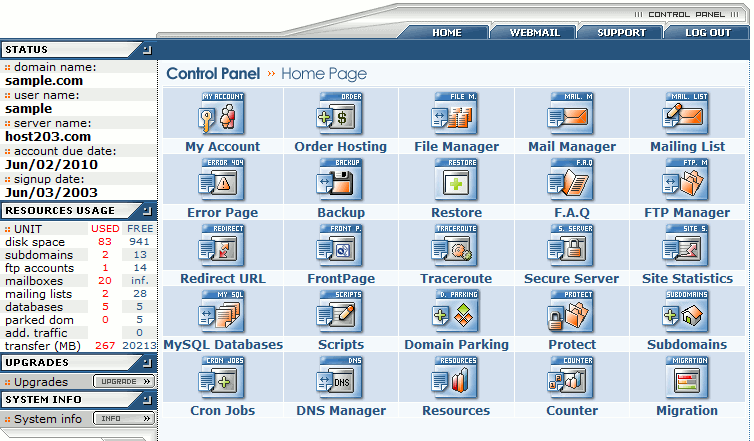 In order to use any of them on your website, the server where it's hosted needs to have the proper software installed. Not every web host offers this capability, but Lesigns does. If you wish to cancel your hosting account for any reason within the first 90 days, you'll receive a full refund for your hosting. Since all .com, .net, .org, .us, .biz and .info domains registered through our services cannot be refunded, they will be subject to a $10.00 annual domain registration fee. This will be deducted from the refund amount, and the domain will remain in your name until it expires. Everyone who hosts their website with Lesigns will have access to SureSupport, who are arguably the best support staff on the web. When you open a support ticket, you are guaranteed a response within an hour, although they will often respond within minutes. You won't get a copied and pasted response, either. These are real techs who know what they're talking about, they'll take the time to read your question, and they'll give you an educated, thorough response in a professional manner. For your added convenience, a "Support" tab at the top of your hosting control panel will take you straight to the support site. These servers are specially designed for the hosting environment. Built with the most reliable server components, they are with 2x Quad-core Xeon processors, 8 GB RAM and RAID 6 disk arrays. The hot-swap HDDs, power supply units and cooling fans allow repairs/replacement of these components while the machine stays online. This design brings the hardware reliability to a highest level. If you want to password-protect any portion of your website, this is easily accomplished through your Lesigns hosting control panel. SSL is a protocol that uses encryption to safeguard the transmission of sensitive data. Compatible with all modern browsers, it is wise to use SSL when you process credit card transactions on your website, or when you have password-protected areas of your site. Site Search Engine: Take advantage of our search engine feature that will help your Web site visitors search throughout your site. Site Search Engine is easy to use and can be installed with the click of a button by logging on to your Control Panel. FormMail: With the FormMail script you can have a contact form on your web site. Your web visitors can submit information through the form which will be e-mailed to you. GuestBook: GuestBook is the place where the visitors to your Web site can post their opinions, recommendations or complaints. Such a feature can provide useful feedback. Gallery: You can easily publish your albums online with our Gallery application. You can upload the photos either via FTP, or through the administrative interface of the Gallery. The application will generate your online albums with thumbnails, and can resize the images for you, making them more suitable for the web. We can host any domain name extension. Just register your web site name and set the DNS servers for it to the ones we will give you, or use your own DNS servers and set up a zone to point to our server's IP address. WAP (Wireless Application Protocol) is a specification for a set of communication protocols to standardize the way that wireless devices, such as cellular telephones and PDA devices, can be used for accessing information over the internet. Our servers are configured to handle applications and scripts that deliver WAP content. The Site Statistics feature found in your Control Panel gives you access to statistics about your Web site, such as hits, visits, etc. Site Statistics are updated once every 24 hours. You can choose basic statistics offered by Webalizer (this is the default setting) or more detailed statistics through AWStats.